In honor of their 50th class reunion, the class of 1968 made a donation to their alma matter. 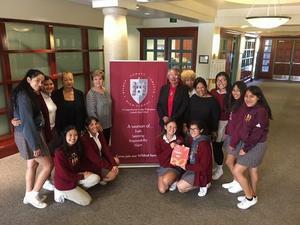 The Bishop Conaty Class of 1968 celebrated our 50th Class Reunion in July 2018. The theme was a beautiful Luau held at the home of our classmate, Caprice DeVeaux O'Connell. The decorating committee worked diligently to transform the already beautiful backyard into a Hawaiian Paradise! This could have never been as successful if it were not for our tenacious committee members: Gretta Williams Sparks, Terry Chavez Lozano, Victoria Farlice Ward, Caprice DeVeaux O'Connell, Lorna Honore, Patricia Fields Thompson, Rhonda Hutchinson Robinson, Connie Lee Chaney, Mercedes Lascano Garcia, Jeanette (Carmen Marin) Beraha, Hilda Mendez, and Cozetta Murphy Bridgeford. Our class hosted over 60 guests to include classmates and friends who came from far and near for this momentous celebration! We sang the Alma Mater and reminisced about the wonderful times on campus as we shared photos from our class yearbooks and experienced an amazing Polynesian meal. As we wound up our event, we thought of students at Bishop Conaty-Loretto that might be in need of a little help, so we decided to donate our profits to the school in the form of a $500 Scholarship. As it turned out, that scholarship provided 15 students with new school oxfords .... we are all elated to give back to an institution that gave us a solid Catholic education and encouraged us to develop life skills that we still utilize today. We look forward to our 55th! To view more picture of the Class of 1968's 50th reunion click here.